During routine archaeological survey at an area known as the "27 Bridge" in Al-Qabari district, one of Alexandria’s most densely populated slum areas, archaeologists stumbled upon a collection of Graeco-Roman tombs. Each tomb is a two-storey building with a burial chamber on its first floor. The tombs are semi-immersed in subterranean water but are well preserved and still bear engravings. Mohamed Abdel Meguid, head of Alexandria's Antiquities Department, explained that the tombs are part of a larger cemetery known as the “Necropolis” (or City of the Dead) as described by Greek historian Strabo when he visited Egypt in 30BC. According to Strabo, the cemetery included a network of tombs containing more than 80 inscriptions, while each tomb yielded information about burial rituals of the Hellenic period. The newly discovered collection of tombs, Abdel Meguid pointed out, is a part of the western side of the cemetery that was dedicated to the public and not to royals or nobles. The tombs are empty of funerary collections or mummies, corpses, skeletons or even pottery. “This is a very important discovery that adds more to the archaeological map of Alexandria,” Minister of State for Antiquities Mohamed Ibrahim said, adding that the discovery would allow scientists to decipher more about the history of ancient Alexandria and would also add another tourist destination to the city. 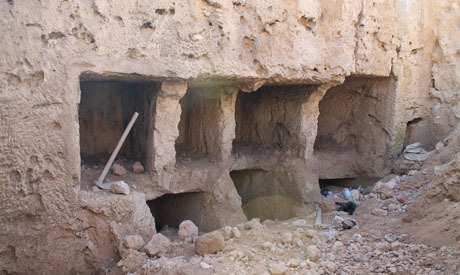 Ibrahim said that this and similar excavations were conducted as part of archaeological inspections routinely carried out at the request of constructors who purchased the land. According to Egyptian law, every piece of land should be subject to archaeological inspection before it can be claimed as a free zone for construction. The area was previously subject to archaeological survey in 1998 when Alexandria governorate decided to build Al-Qabari Bridge over Abdel-Qader Hamza Street in the district. Excavation at the time uncovered more than 37 tombs, among which a very distinguished tomb bearing a coffin in the shape of a bed, commonly known as the wedding bed. On top of it was a red sheet and two pillows.